The three-tier system. Those few words bring up a lot of emotion in the beverage industry. I get it. Twenty years ago, I started selling my family’s wine. Over time, the distributors began to consolidate and then they consolidated some more. It became very difficult to navigate the system–we just didn’t make enough to matter. It was expensive and most importantly frustrating that I could not make my sales goals. LibDib launched in March 2017 and we started signing up Makers by the hundreds. Shortly thereafter, restaurants, bars and retailers in California and New York started buying products through our platform. Suddenly, the small California winery or distillery, who have never had the opportunity to sell into that one retailer in New York, can, via LibDib. And while we are doing things differently, LibDib is not disrupting the three-tier system. Our plans are to help the system evolve. An evolution that will allow all small businesses access to the marketplace via technology. As a three-tier compliant distributor, we follow the rules, pay taxes, report, collect, take credit risk and showcase products to buyers on a beautiful (if I do say so myself), modern web platform. I even went to Washington, D.C. recently and met with people who are all working with technology and the three-tier system (you can read all about that trip here). However, as a distributor we do things differently (distribution for all, smaller margin, no aging inventory, etc etc). We have a group of super smart engineers who work hard everyday to leverage the internet that is driving this evolutionary process. We have some incredible partners as we continue to build this company and our vision of the industry to come. The Makers, who needed a distribution option, are willing to try us out. 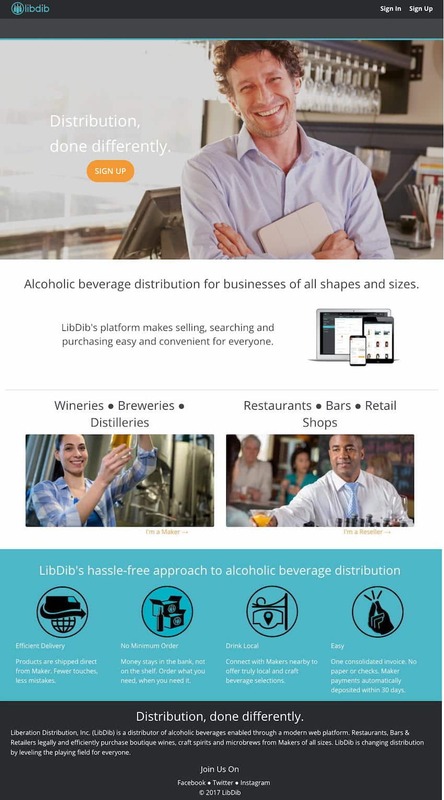 The Buyers, who want access to truly craft, family-owned and micro-production spirits, beer and wine, decided to try LibDib. And now here we are, all using this technology to change the way we do business. And the cool thing…..is it’s working. As we approach the end of 2017 I can say that evolution of the three-tier system is in motion. Does every brand have the option for distribution in every state? No, not even close. But, now there are options. And we are going to work our butts off so that all Makers get a distribution platform. Is it going to take a while? It sure is! But guess what? In just 9 months we’ve gone from zero to over 1,000 new products in distribution. And we can handle 10,000! Or 100,000 (so thankful my engineers know how to build to scale). I’m extremely proud of that. I’ve lost sleep (lots of sleep!) over the last year and a half, but our team has developed a platform that will do big things for this industry and the system that has been in place since our grandparents came into the world. After all is said and done, this is an evolution. Transportation, recreation, banking, education, the list keeps on going…have all evolved, so why not the alcohol industry?